Watches are cool. Like the Rescue Knife they are the badge of the outdoor professional or rescue team member. For some, the ultimate watch would be an a classic icon like the Rolex Explorer, for others it may be brimming with functional technology like the Suunto Ambit. Whilst these are undoubtedly great watches does that make them appropriate for everyday work in the outdoors or rescue? The function of a watch is simply to tell the time, so why are additional functions ranked so highly...especially if they are rarely used? Like any piece of equipment you need to differentiate its purpose; an aviator style chronograph or divers-style watch with a sizable bezel look the business but for the purpose of telling the time, quickly and easily, a large uncluttered face is all you need. Is this being a bit pedantic? Possibly for most, but knowing the time is essential in group management when pick-ups, drop-offs or Rendez Vous are agreed. Recording the time is an important aspect of Incident Management. Knowing the duration of a medical episode of a casualty (a seizure or chest pain, for example) can be important information required when handing over a casualty. Look at the two examples of 'cluttered' watches on the right: How easily could you notice the time 'at a glance' in low light, a blizzard or in a dusty or smokey environment? A watch with a flat battery is no use to anyone. 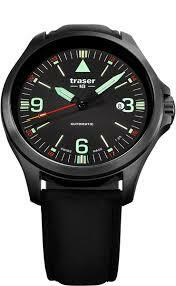 Analogue watches are available with automatic mechanism, and therefore no battery which will every be replacing. This is important if you travel extensively and are unable to find obscure watch batteries easily. If you prefer the reliability of quartz movement (as opposed to having to reset your automatic watch if you only wear it occasionally) or don't want the added cost of an automatic watch, can you change the watch battery yourself? Some watches such as the Suunto range and CWC military watches have this feature so they can be replaced in the field, negating he need for an experienced jeweller with specialist tools. Analogue watches are easier to read at a glance. From first learning to tell the time on a watch or clock with hands, the positioning of these hands are much easier to interpret than a digital display made up of four rectangular digits. The movement of a sweeping hand around a dial is also easier to gauge than the changing of digital figures, for recording duration or the passage of time. However, digital watches are much more resistant to violent knocks or vibrations than their delicate mechanical counterparts, especially with cheaper analogue watches. In terms of accuracy, a cheap digital watch (from a known brand) will be as, if not more, accurate than an expensive analogue watch. There are two schools of thought here; Invest in the Best or the Sacrificial Lamb. When we are choosing kit for work we will sometimes pay more for work items than we would for everyday items because we either need to rely on them to do our job properly or we need them to last longer given the amount of wear and tear they are subjected to. Alternatively we sometimes spend less on items for work because we know they are going to be abused, broken or lost. Whichever you choose there is absolutely no reason to spend more than you need: after reading this article, someone commented "buying a watch is a bit like betting on a horse: how much money would you be prepared to loose?" Rugged digital watches, like the Casio G Shock range start from as little as £30. Hard-wearing, good quality analogue watches are available from a reputed brand like Seiko, Tissot or Rotary. Anything up to £300 will retain it's accuracy, will be robust, waterproof and smart. There is absolutely no need to spend any more than this other than as a display of wealth. Life is full of compromises and an issue with bombproof watches is that they tend to be significantly larger and bulkier. Large faces are great for visibility but an unnecessarily large watch can present problems when working around rocks, rubble or machinery where they are likely to be snagged and damaged, or at worst, trapped. In these situations a slim, low profile watch is a benefit. A further benefit of a cheap, unobtrusive watch is that they do not stand out; depending on your situation - be it working with disadvantaged communities or a hostile environment abroad - the last thing you want to do is advertise wealth. When working in the dark, be it on a night exercise, confined spaces or other low-light conditions, an illuminated watch is the only other function necessary. A digital watch should have full-face illumination (remember old school digital watches from your childhood where the 'light' was a microscopic diode in the top left corner which only illuminated one corner of the face?). The ultimate illumination for an analogue watch comes from Gaseous Tritrium, a self-illuminating light source which is always 'on'. Being able to view a watch in the dark without needing to press a button is a real benefit when your hands are occupied. One of the first brands to release this kind of watch was Traser who produce a fine range of watches, many of which are quite 'cluttered' with large bezels but the P67 Officer Pro Automatic is great example of a simple, clean, easy to read face. Probably the least import factor but a factor nonetheless. Metal straps are certainly hard-wearing but uncomfortable in extreme cold environments and a possible hazard when working near extreme heat. Plastic or rubber straps aren't susceptible to such hazards and their weakness can be a strength; there is something comforting in knowing that if you got your strap could on something you could release yourself with a sharp tug, albeit at the expense of possibly loosing your watch rather than loosing your hand because of an indestructible watch strap. Synthetic straps can also melt with continued exposure to strong insect repellants so should be avoided in these environments. Our favorite strap is the webbing buckle (sometimes referred to as a 'NATO strap' ) or velcro 'sports' straps. The weakest point on any watch is the sprung pin which holds the strap in place, if one of these breaks with a traditional two piece strap you will loose your watch. As a webbing or velcro strap is one-piece which passes through both watch pins, if one pin breaks your watch is still attached to your wrist - particularly useful if you are in the 'Invest in the Best' camp. The (wonderfully named) Casio W-86-1VQES. An unobtrusive, uncluttered, full face illumination watch with alarm and waterproof to 50m. And available on every high street for less than £15. No rotating bezel, no 1/60th second chronograph, no tachymeter, not waterproof to 300m with screw-down crown and nitrogen escape valve but...it tells the time well and allows you to keep your James Bond watch for Sunday Best. A word of warning, however, the strap is very small; opening up to only 20cm circumference on the last hole. A cheap 18mm width NATO style or velcro strap will be needed if you have large wrists.